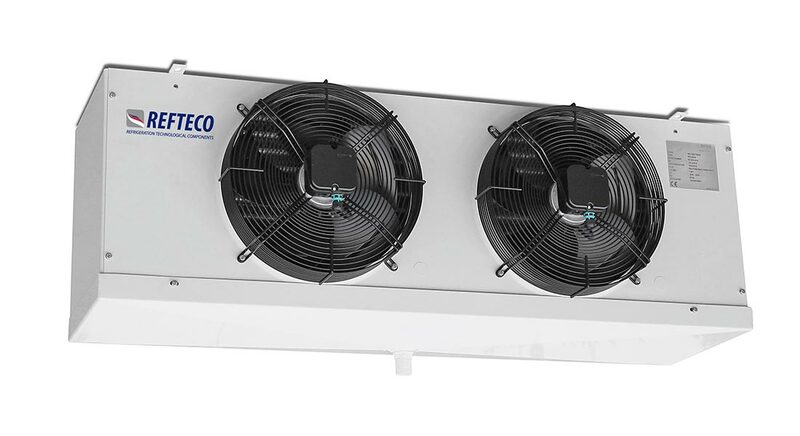 Cubic air coolers super compact for small and medium storage cold rooms with volume from 20 to 600 m3. Thanks their heavy construction they are suitable for storage of fresh or frozen food with temperature from -30 to +20°C. This new series of air coolers provides very efficient heat transfer, high air throw, reduced dehumidification, low energy consumption and very compact overall dimensions. Heat exchanger: configuration with high thickness tubes and fins for heavy applications. Optimized heat exchanger volume and innovative refrigerant distribution refrigerant. Options: Stainless steel tubes, stainless steel casing, stainless steel fins, coil coating, EC fans, special fans with high static pressure, ATEX fans, insulated drip tray, fans ring heaters.